This past weekend we decided to get ourselves outside and enjoy the snowy weather. Yes, I did just say the words "enjoy" and "snowy" in the same sentence..... and the world isn't ending! Who knew?! I have been doing really well with my weekly routines of yoga and cycling. I throw some running into the mix now and then, but since I am not a big fan of running .... I'm sorry, no matter how hard I try I just. cannot. get excited about running. Although I've been doing well with my routines, I felt the onset of boredom coming on so I knew I had to do something a little different this weekend to change it up a bit! Boy, am I glad I did! 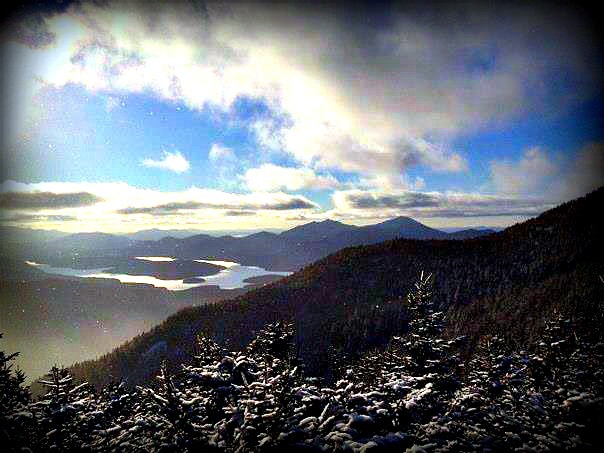 The fiance and I got a group of friends together and drove to Lake Placid to hit up Whiteface Mountain. It was amazing! I haven't really gone skiing much this winter season, and definitely NOT on a hill as big as Whiteface. It took a little bit to get myself to feel comfortable with riding such a gigantic hill, but once we went down a few times it felt liken nothing awesome! What was even better was the workout we got from going all weekend! We did 2 days (technically 1 1/2 since we had to drive home late last night) and it was such a great workout! I didn't even feel like I Was exercising, which is always the best kind! Plus, it was great to do a little getaway for the weekend with some of our friends -- we haven't really done much of that in a while since the engagement so it was definitely an awesome all-around trip! What are some of your favorite places to ski or snowboard?!? You shouldn't apologize for not liking running, it's not for everyone! The most important thing is to stay active, no matter how you do it! I've never been skiing. It looks like fun, but I doubt if I could even stand up!! Thank you for those words of encouragement! I still make myself run even though I don't like it, but since I struggle so much with it, I find that I am more willing to exercise if I change up my activities. Skiing is sooo much fun! It does take some time to get used to balancing and whatnot, but once you get going it is so much fun! You should definitely at least try it -- just make sure you go with someone who is good at teaching, or take a personal lesson. It really does make all the difference in the world! I haven't been skiing since being a teenager. I married a South African and we live in a Mediterranean climate. Last year we took the kids ice-skating in Cape Town at an indoor ice rink and I had to re-learn how to skate. It sounds like you had a lot of fun! :) I'm now following with GFC. Ahh, what I wouldn't give to live in a Mediterranean climate! Don't get me wrong, skiing is fun, but I would LOVE to live somewhere warmer! Maybe someday.... :) Glad you were able to get some ice skating in with the kids though! I bet they had a blast!